The instrument shown – a 5-string made from highly-figured Curly Maple with a golden stain – is one of the first instruments I made. It uses an L.R. Baggs bridge pickup system, a Thomastik-Dominant 5-string tail piece and traditional wooden pegs. 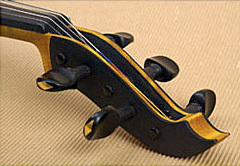 The “history” aspect of this instrument is the shoulder rest shown in the photos. 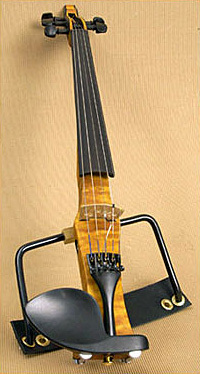 This shoulder rest was the evolutionary precursor to the “Shoulder Rest Frame” that I now use for all my instruments so that any acoustic violin shoulder rest may be used when playing. Though the shoulder rest in the picture was comfortable, it didn’t have quite the stability that I desired. 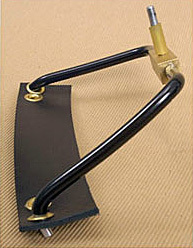 And so, I developed the “Shoulder Rest Frame” that you see pictured in the Gallery. 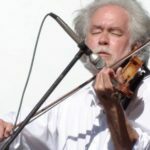 The wood for this instrument was procured from one of my wood suppliers in Veneta, Oregon. The wood has stunning, complex curl, and looks beautiful when the final finish is added.